"We will never give up for Libya – no matter how long the struggle takes. We are determined to build the Libya we have always dreamed of." On June 25, 2014, the day of the first general election in Libya in almost fifty years, Salwa Bugaighis was assassinated in her own home by armed men who felt threatened by her message of peace and democracy. A key figure in the revolution against Gaddafi, and an activist throughout her life, Salwa fought fearlessly, persistently, and tenaciously not just for women’s rights, but the rights of her fellow Libyans to live free of oppression, persecution, marginalization, and torture. As a lawyer, she campaigned on behalf of political prisoners under the Gaddafi regime. 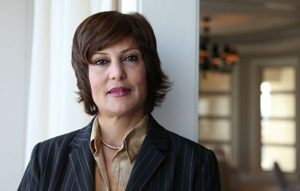 As a member of the National Transitional Council, Salwa led advocacy to lobby for a higher quota for women’s representation in the decision-making process. As the recently appointed deputy head of the National Dialogue Preparatory Council, she pushed for open dialogue and peaceful resolution. In October 2011, Salwa co-founded the Libyan Women’s Platform for Peace (LWPP) with Zahra’ Langhi and over thirty-five women from different cities and backgrounds. LWPP was designed to ensure that women remain a vital part of post-Gaddafi Libya, with a particular emphasis on inclusive transitions, women’s rights, youth leadership, advancement and security as related to women’s political and economic participation, constitutional reform, and education. Thanks to Salwa and her partners’ fearless work, LWPP has since grown into a network of over 100 organizations and people. Salwa had been targeted because of her gender and her commitment to bring about progress in Libya. Her charisma, strength, and drive inspired others to follow her in her fight to create real change, and galvanized an entire movement in Libya. Salwa refused to give up, and to her last breath, she continued to campaign to ensure that the values of the revolution were not forgotten, but honored and integrated into the very fabric of Libya: from its government and its laws, to the hearts of its citizens. We must honor her memory and her work by carrying it forward. Today, please make a contribution to the Libyan Women’s Platform for Peace.